I don’t know about you but as I gain knowledge in life, I find myself more and more having to bite my tongue. What I might think and what I might say are often two very opposite things, and I like to talk a lot. It used to just come out of my mouth, like lava from an active volcano, but now I find a measured and guarded response often goes down better. My more jaded view of the surf industry sometimes just does not translate to people who chose the ‘red pill’ manufactured and sold by exclusively by the World Surf League (don’t get me started). If I were to speak my mind more often, I am certain I would attract looks usually reserved for conspiracy theorists. Imagine my surprise then when I stumbled across a whole bunch of folks who shared parallel views and opinions. I know... the joy, right! I am not alone after all and somehow feel validated about not becoming a sinister web crawling being. In my personal view, the subjects that need to be addressed are most of the things in the surf world, but not what I see in many global surf publications. I don’t want to speculate as to if Kelly (Slater) wears a thong under his boardies and if so what colour it would be. I don’t care if it’s made out of recycled lobster pots either (might be a bit uncomfortable). There are simply more pressing topics out there. Hurrying now to my point, I would like to enlighten you as to where I stumbled across others that seemingly shared my distaste for coloured thongs in professional surfing no matter who was wearing them. Stevo and Helene have made something truly special. The Real Surfing Magazine. It’s about bringing surfing back to surfers. That doesn’t mean you have to be part of a club or you are not welcome but just the opposite. The guys who produce and write for the RSM are addressing real problems, collating interesting and humorous points of view, topics and opinions that most surfers (who didn't swallow the aforementioned pill) can relate to. Okay, so this begs the question: Why am I championing another magazine? What about Surf Bunker? Ha, well you have a point. In this dog eat dog world of business and numbers, advertisers and sponsors of the good old ether-web, we spend so much time shouting about ourselves and drooling over others' apparent successes that the honest and genuine achievements of the worthy can go unnoticed. This mag, in my opinion, is worthy of notice, nay, of more notice. Steve and Helene write, collate from other contributors and produce a yearly magazine that is only in print. Yep, that's the first cool bit. In print which, I can tell you is the ‘Shangri-la’. I would love Surf Bunker to be in print but the reality is the amount of work and risks are far too great. Attracting advertisers that are a ‘necessary evil’ as with any publication is a lot trickier. That said, if you have the kahunas to go for it, the end result is a timeless tangible thing that relies not on ether speeds or battery power, it is just better. Print is better, no doubts. Sometimes I wish I could go back and take the red pill. What is it they say? 'Ignorance is bliss'. I have had my copy of this year's RSM for about a week. It has gone with me everywhere, I tell you, I could not and did not want to put it down. There was not a single bit that I did not want to read, that did not engage me and that, my dears, is very rare. From the ‘on point articles’ about real surf culture to the unlikely and blindingly immersive interviews with surf industry greats who actually have things to say. It’s kind of the opposite to watching a WSL after-heat interview. Interesting. There’s more, the RSM has a ridiculously tiny amount of ads which is so very refreshing in a mag but I suppose with no shareholders' cigars to fork out for it must be doable. The remainder of the pages are crammed full of text with occasional mouthwatering shots in there to keep those surf synapses firing. This is the fifth edition of RSM, it’s getting bigger every year and I can’t see why it won’t get bigger still. The magazine itself is a mixture of writing from able chaps and chapesses that have contacted with RSM and interviews with legends that have made the time to go and chat with Stevo and Helene. Its a step back to the way things used to be and maybe should still be. Andrew Kidman (Litmus) talks to Stevo and Helene. To sum up, if you are interested in surfing and want a good read, just contact Stevo on their Facebook page here and he will send one out for you (if there are any left) you will not regret it. Right, now back to reading instead of writing, I am currently composing this from the ‘doghouse’ as my wife is fed up seeing me with my head buried in a magazine. Oh, the joys. Editors Note: In the interest of full disclosure, I may for once not be totally unbiased as maybe a piece written by yours truly ended up the mag. Funnily enough, I can’t read that bit without inwardly screaming ‘koooook’. Happy reading to all those who like to consume real and ‘on-point’ surf literature. Hzzarrr. The world is not complete without Chuck (fact). The guys have thrown in some actual facts about the 80's action supremo. 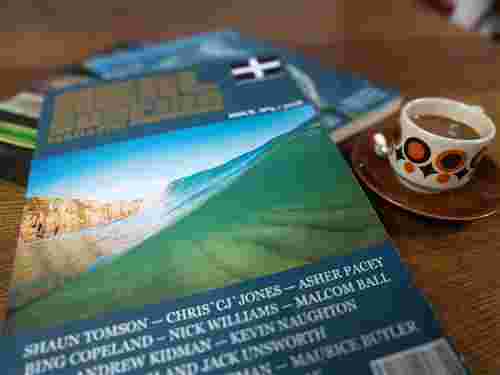 Issue number five of the mag also features, well, not your usual chat with Asher Pacey.